Hope everyone had a great weekend! It has been crazy around my household that last week and I apologize for not posting, visiting and commenting. I promise I will be back in full force real soon!! My daughter purchased a home about 10 days ago and found out Friday night at 8pm that the inspectors suggested that it be painted (outside) before the appraiser comes on Wednesday (as they would call that and we'd have to paint it anyway but would save us the cost of a re-inspection) ...so guess what....part of the agreement was we would paint. However, we thought we'd have more than 5 days to do it in. Yikes! Well, we hit it hard and of course, it had to rain part way through it all and made a mess for us and had to re-do one whole side (weather..not in our favor) We did manage to get the house done and now onto the garage with 2 evenings to finish it in. Keep your fingers crossed for us! Along with that, I committed to help my daughters girlfriends throw a baby shower for my daughter which was on Sunday with about 50 people attending. So, I had food to prepare and set up that I said I would do...so I was probably looking like a crazy women~it's been a blur that last few days. Now I have to pass this award to 10 other friends. This is so difficult because there are so many wonderful bloggers and I enjoy all of you. But, here goes.. These are in no particular order ( I am passing this award to a few more than 10 because I just can't stop at 10.....hehe) Please be sure to stop by and pay a visit to each of these fabulous ladies. You will love visiting because they are so talented and are so inspirational. Have a great day and thanks again Amy for the award!!! 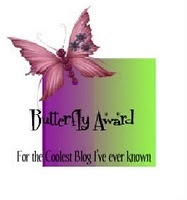 Congrats on the blog award! Good luck with the getting the house ready :) Sounds like you deserve a big long crafting break when you are all done!! Congratulations on your beautiful award, Sherri! Wow Sherrie! That is a lot going on at one time! I hope the weather is nice until you are finished! You need a crafty retreat when you are done :) Congrats on the award and Thank You so much for thinking of me! Congratulations on the Butterfly Award!!... and to your daughter on her new home. Makes a parent feel proud when the kids take this big step. Good luck with all of your activities!! Congrats on your award! You totally deserve it :) No worries I know how it feels to have a super busy life right now and completely understand how you feel! So thankful for all of my wonderful (and patient) followers too! Thanks Sherrie for thinking of me! I so appreciate the award! I understand not being around lately, started back to work this week! I will try to get it posted tomorrow! Oh boy! What an adventure you've had! Sherrie, I know how crazy life can get at times. We've had quite a month here as well! My thoughts are with you as you work your way through all you have to do. Congratulations on your award! It was fun to learn more about you!